We aren’t trying to talk ill of a more traditional lifestyle. Not everyone will enjoy RV life. But for the road warriors like us, RV living simply offers more. Many people spend most, if not all, their life paying off their home. Full-time RVers are able to pay for their home in significantly less time. 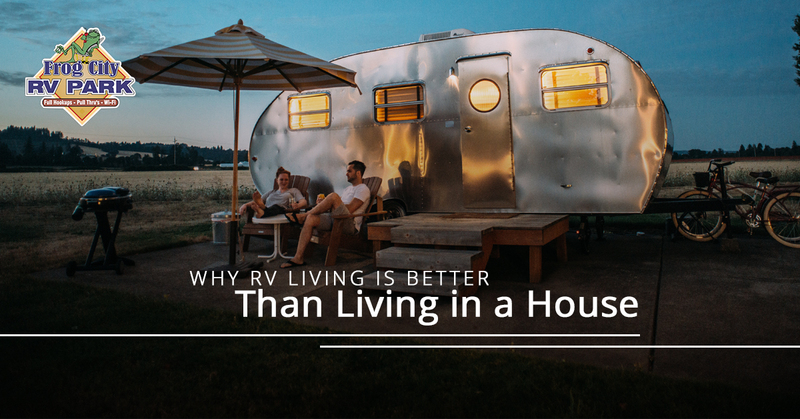 In fact, most RVs cost roughly the same as year’s rent, so you could have your home completely paid off in a mere year. Why pay exorbitant rent for a mountain view when you just drive there yourself? In fact, you don’t even have to keep that view; you could change it out for an ocean view, wide open plains, or deep green forests. When you have an RV, you can experiment with living in all different parts of the country. Don’t like a place? You can just roll away without a second thought! Love a place? Go back and visit whenever you want. When you’re living in a 30-foot space, you learn to let go of what you don’t really need. RV life means less clutter and a cleaner space, because you can bet that you’re not going to want to leave a sink full of dishes when you have a smaller living area. When you live in an RV, you can enjoy a clutter-free, clean home because you will prioritize it much more. You can eat healthier and spend less money while traveling when you use an RV. With access to a kitchen anywhere you are (even when you’re on the road! ), you don’t have to waste your funds on eating at every greasy diner you pass. You can make your favorite meals while traveling, avoiding that icky, post-vacation fullness. RV life provides unique challenges that you may never have faced before. From planning your trip to learning how to troubleshoot any problems that pop up, you learn a variety of new skills, and from that, you grow. There is nothing like the open road for self-exploration, so when you RV, you have a unique opportunity to learn more about yourself as you learn more about the country. Many people spend their money on things, hoping it will give them happiness. At the end of the day, it’s experiences and relationships that give us joy, not stuff. Instead of filling a house with things you’ll never use, RVing allows you to experience new things every day, making memories with your loved ones along the way. Meet new people, see different parts of the country, and learn more about yourself along the way — that’s what life is really about. When you’re passing through Louisiana on your adventures, we hope that you’ll stop in for some Cajun hospitality at Frog City RV Park in Lafayette! We offer comfortable, clean, and safe campgrounds for RVers crossing through the Bayou State and taking in all the amazing history and gorgeous landscapes we have to offer here in Louisiana. Book your spot today!